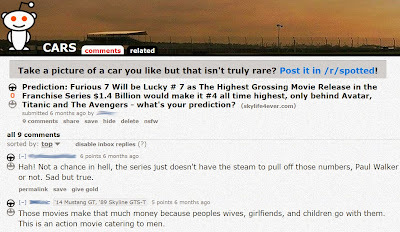 6 Months ago, I wrote down an open prediction about how I thought the future success of the movie 'Furious 7' would go, titled: Furious 7 Will be Lucky # 7 as The Highest Grossing Movie Release in the Franchise Series - Because: Paul Walker. At the time, we were still 5 months before the release of the movie, which only just premiered in theaters April 3, 2015. After the article was posted here on The SkyLife news blog I posted a link to the article on a public forum site, partially to provide verifiable proof of my claim through an independent third party site, and partly because I was curious to know what other fans of the movie franchise would think of my wild prediction. "Hah! Not a chance in hell, the series just doesn't have the steam to pull off those numbers, Paul Walker or not. Sad but true." "Umm in the top ten for 2 weeks"
In my original post where I made the prediction, I used data from Google Trends and World Wide Box Office Gross earnings figures, coupled with release dates of previous sequel movies to correlate (through a very basic regression analysis) what kind of increase we might expect for Furious 7. I applied two functions, one linear and one power function to come up with an equation that might seem reasonable at the time, given the data we had. Today, at the time of writing this, my prediction has come to within 3% of the power-function (power actually had the better R-squared value) predicted amount of: $1,454,699,597 as compared to the actual World Wide Box Office Gross Revenue of $1,489,386,455. 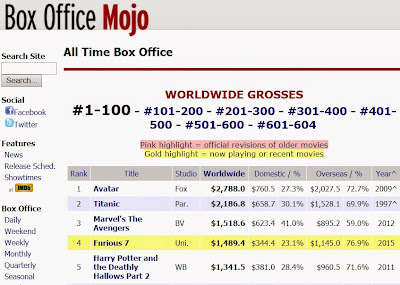 I think now is a fair time to call it because Furious 7 is pretty much only earning long tail revenue, now that Age of Ultron is dominating theaters everywhere. 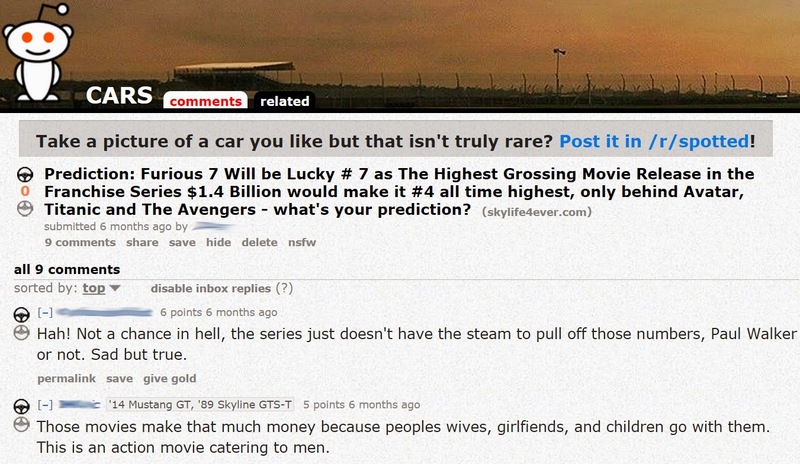 I also gave a positional ranking prediction at that time too, I stated that 'Furious 7 would be the 4th highest grossing movie of all time, right behind Avatar, Titanic and The avengers'. 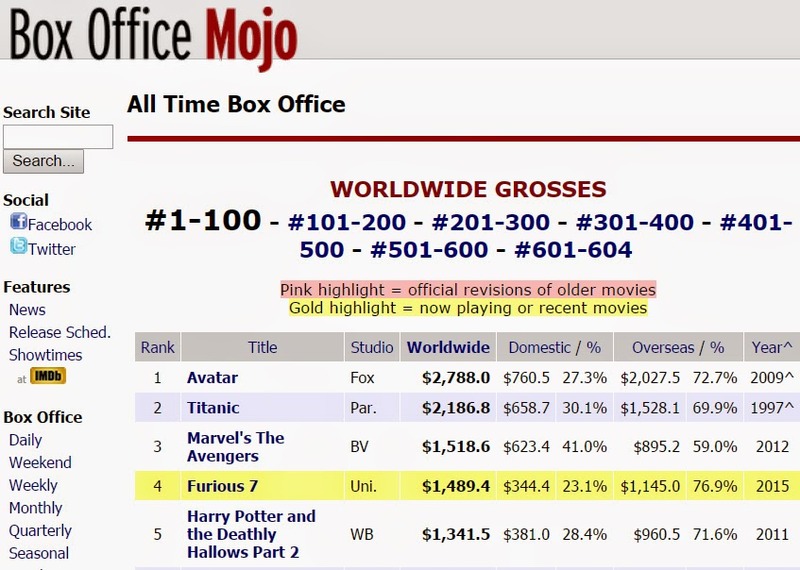 As of today, Furious 7 is most definitely the fourth highest grossing movie of all time. Well, to be honest this prediction was kind of done in jest, yes I did some numbers work and showed my math, but I'm not entirely convinced that this sort of result isn't just a stroke of luck for me. That being said, I'm planning to analyze a few more movies, releases, revenues and see if this (or similar) modeling approach can be repeated successfully. What's interesting, is usually one would analyze historical data and trends, derive a model and make a prediction about the future. In this case I seem to have successfully got the cart before the horse and now looking to see if it's just luck or not.